In my other thread I mentioned hauling grain and flour in and out of Port Colbourne. When I drove for Masterfeeds and Supersweet Feeds in the eighties Port Colbourne had huge grain elevators, such as Maple Leaf Mills, Goderich Elevators and Robin Hood. 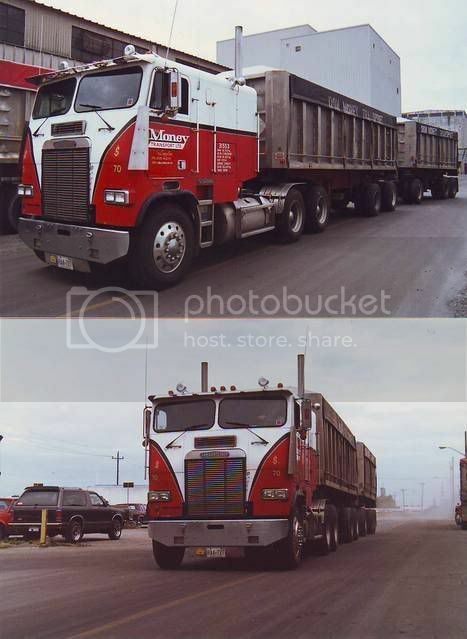 I always liked this shot I took of this Freightliner cabover that belonged to Money Transport. One day I was unloading wheat at Maple Leaf Mills when this big Freightliner was leaving I asked if I could get some pictureS. He said sure then said he would drive out spin around then I could get some action shots of him coming back in. I have found on some occasions some drivers are so proud and will do anything if you ask for a pic of their truck. The owner driver was Don Money. They are still in buisness and run Mack CH's.